With similar portfolios but very different dividend yields, you might be tempted to go with Senior Housing Property Trust. Read this first. The baby boom generation is cresting into retirement, with this demographic wave driving demand for healthcare assets for decades to come. That's the backstory for healthcare real estate investment trusts, or REITs, like 5.6% yielding HCP, Inc. (NYSE:HCP) and 8.3% yielding Senior Housing Properties Trust (NASDAQ:SNH). Since REITs are a dividend-focused asset class, you might be tempted to buy the healthcare REIT with the highest yield, but don't make that mistake. Dig into the story a little bit more. From a top-down perspective, Senior Housing and HCP have very similar portfolios, spread largely across senior housing, medical office, and medical research facilities. Both have exposure to other areas as well, but these three sectors are the core of their portfolios. That's something of a mixed bag right now, because overbuilding has left a supply overhang in the senior housing space (which should be absorbed over time as baby boomers age), while medical office and medical research assets are in relatively high demand right now. That said, there are some subtle differences worth noting. HCP's senior housing business makes up around 40% of its portfolio compared to 50% for Senior Housing. And medical office and research assets are about 50% of HCP's portfolio but around 40% of Senior Housing's mix. In other words, HCP's portfolio is slightly better positioned today. That helps to partly explain the higher yield you'll find at Senior Housing. Having slightly more exposure to the relatively weak senior housing sector is only the top level of this comparison. When you dig a little bit deeper into these two REITs' senior housing portfolios, a key difference quickly comes to the surface. Roughly 60% of the communities Senior Housing Property Trust owns are operated by a single tenant. HCP's senior housing portfolio is more diversified across five main customers, with the largest tenant providing just 35% of the company's net operating income. 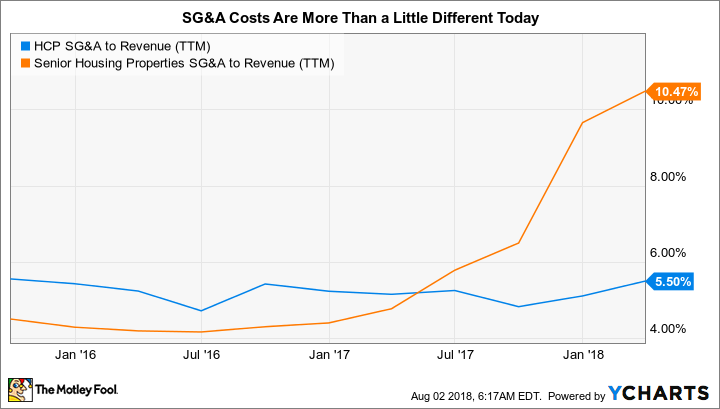 In addition to having a more concentrated customer base in the senior housing sector, Senior Housing's largest tenant, Five Star Senior Living, also happens to be one of its weakest lessees. Rent coverage for Five Star is just 1.15 times compared to its second largest tenant Brookdale Senior Living's 2.3 times. Brookdale, by the way, is HCP's largest tenant. Senior Housing's higher yield is partly explained by this not-so-minor fact as well, since it increases the risk in the REIT's portfolio. Another notable difference between these two healthcare REITs is how they are managed. HCP is an internally managed REIT, while Senior Housing is an externally managed REIT. This may not seem like a huge difference from an investor's perspective, but it should. For starters, HCP's entire business focus is on running its portfolio to the best of its ability. Senior Housing, on the other hand, is managed by The RMR Group Inc. (NASDAQ:RMR). The RMR Group oversees several different publicly traded REITs that each operate in a unique real estate niche. It also manages Five Star Senior Living, Senior Housing's largest tenant. In addition to these businesses, it manages other real estate assets, including a closed-end fund that invests in real estate securities and a mortgage REIT. The management team at HCP tries to do one thing and do it well; the team running Senior Housing has a lot more on its plate. HCP Book Value (Quarterly) data by YCharts. Which brings us to compensation. Clearly HCP's leadership does better as the REIT performs better. You would expect that at any company. The same is true for RMR Group at Senior Housing. However, RMR Group's compensation is partly driven by the size of Senior Housing's portfolio. There's a potential incentive there to grow simply for the sake of growth with less regard given to the quality of that growth. 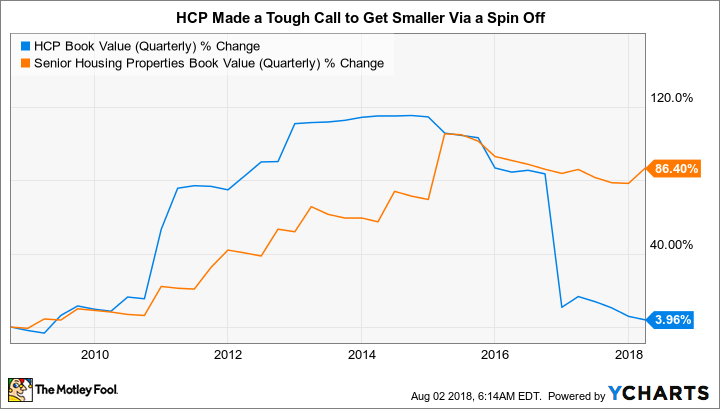 Note here that HCP recently jettisoned an underperforming business (nursing homes), shrinking the company and refocusing it around better-performing assets. HCP SG&A to Revenue (TTM) data by YCharts. With RMR's focus spread across multiple businesses and the potential for incentives that don't fully align with Senior Housings' shareholders' interests, there's notably more complexity and uncertainty for investors to consider. Which is one more reason for the higher yield. To be fair, I don't think Senior Housing is a bad healthcare REIT. But I do prefer HCP here because of the subtle differences in their portfolios, the makeup of their respective customer bases in the worst-performing segment of their portfolios, and the very different ways in which they are managed. These are some of the key reasons why HCP's yield is just 5.6% and Senior Housing's yield is 8.3%. That said, for more aggressive investors willing to take on the extra risk and uncertainty in Senior Housing's business, the extra yield might be worth it. For me, however, it wouldn't be. I'd rather keep it simple and go with HCP.